As part of the 2014 Lexus IS introduction, attending members of the media were allowed to take several different 2014 Lexus IS models around a test course delineated by traffic cones and compare them to equivalent vehicles from competitors Audi, BMW and Mercedes-Benz. All models of the all-new IS demonstrate the design revolution Lexus began with the spindle grille taken to its final culmination. The basic lines of the grille have been extended to define and compliment the hourglass shape throughout the body, contributing to the low coefficient of drag gained by the third-generation Lexus IS. Notably in front, the LED daytime running lamps have been divorced from the headlamps creating a very striking front visage. Upon entering the 2014 Lexus IS 250, the new angle of hip-placement in the seats became readily apparent, resulting in better spinal support and thus a more comfortable ride. The seats themselves utilize a new foam injection system allowing for a more aesthetically sculpted form, with moderately enhanced bolsters to keep you comfortably in the proper position. Seats, along with telematics and automotive connectivity, are aspects of car interiors currently in a rapid phase of evolution and development. The twin gauges in combination with elements of the steering wheel created a happy face of greeting as I started the IS 250. The 2500 cc engine seemed to get a maximum of torque out of its 204 horses as the Lexus accelerated up the opening straightaway on the performance and handling course. The 2013 Audi A4 2.0T gets roughly the same horsepower as the rear wheel drive 2014 Lexus IS 250 with a six-speed transmission, from an engine one half-liter smaller and a continuously variable transmission, thanks to direct injection and turbocharging. Personally, the Lexus IS 250 seemed to accelerate with greater authority, despite the 7 extra horses in the TSFI engine, but the Audi did have even tighter steering – something for which Audi is renowned. At it’s base model the Audi A4 costs slightly less than the $35,950 starting price for the Lexus IS 250, but at the higher end is considerably more than the IS 350 with all available options. Next we drove the IS 350 rear-wheel-drive model and found it pleasantly exhilarating for a sedan most people wouldn’t take to the track – that said, those who do will probably find it worth the effort. With its 306 horsepower the IS 350 tackled the performance course with vigor while the variable gear ratio steering became easily noticeable and well appreciated through the tight turns and winding curves. We were thinking this generation of the Lexus IS has take a virtual quantum leap from the previous model even before we drove the impressive 2014 Lexus IS 350 F-Sport. A prerequisite to that involved comparing the 2013 BMW 335 and a Mercedes-Benz C350 AMG to the 2014 Lexus IS 350. The BMW accelerated well, but seemed to go through a lot of gears to accomplish equivalent speed, compared to the relatively smoother acceleration of the Lexus. Furthermore, though the Beamer demonstrated the taut handling and steering for which the brand is well known, it made the enhanced rigidity of the new IS more noticeable. In fairness to the brand, when the 2014 models are released, we’ll take another look at this aspect of the comparison. We think that might have been our response, even without the previous suggestion, in the same situation. Though it accelerated with great authority, the way it handled the tight turns and curves was exactly as the other driver described it – rough and rather rudely – lacking the finesse shown by any of the other sedans. The final performance run of the day was in the very gratifying 2014 Lexus IS 350 F-Sport. This vehicle contains a slice from the soul of its antecedent Lexus IS-F and even gauging inspired by the LFA supercar. It is a car that would be a joy to drive on the open highway or the track and is likely to attract an even younger range of affluent drivers to the brand and the model. 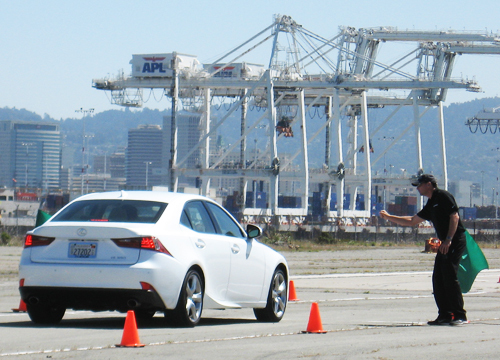 The final exercise at the Alameda Naval Station involved two time trials around a half mile track, delineated by traffic cones and featuring a designated stop box –drivers had to come to a complete stop within it for their times to count. Not one normally privy to this type of driving, we were happy to see a 2.5 second improvement between the first and second laps, despite being a full 6 seconds slower than the top drivers that day. The models provided in San Francisco were pre-production models and certain small tweaks could be made as the 2014 Lexus IS variants take a place on the assembly line. For the record, this is one of the few models for which no hybrid is planned or anticipated in the US. That may have something to do with the four different models getting combined EPA mileage estimates from 26 to 30-mpg, without the use of direct injection or turbocharging. Though the economy is still in recovery, few things draw market interest like refreshed models – a plethora of which are now in the Lexus lineup. The new 2014 Lexus IS 250 and IS 350 are excellent examples of that fact.